In your letter of June 18 you enclosed a certain modification of an order with regard to the use of material in the manufacture of distilled spirits for other than bevereage purposes. This order had been prepared in this office and was approved by the Secretary of the Treasury. 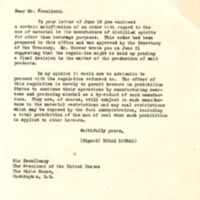 Mr. Hoover wrote you on June 21 suggesting that the regulation might be held up pending a final decision in the matter of the production of malt products. In my opinion it would now be advisable to proceed with the regulation referred to. The effect of this regulation is merely to permit brewers in prohibition States to continue their operations by manufacturing near-beer and producing alcohol as a by-roduct of such manufacture. They are, of course, still subject in such manufacture to the material restrictions and any coal restrictions which may be imposed by the Fuel Administration, including a total prohibition of the use of coal when such prohibition is applied to other brewers. Rickard, Edgar, 1874-1951, “Edgar Rickard to Woodrow Wilson,” 1918 July 22, WWP19466, Hoover Institute at Stanford University Collection, Woodrow Wilson Presidential Library & Museum, Staunton, Virginia.